Most people in B.C. 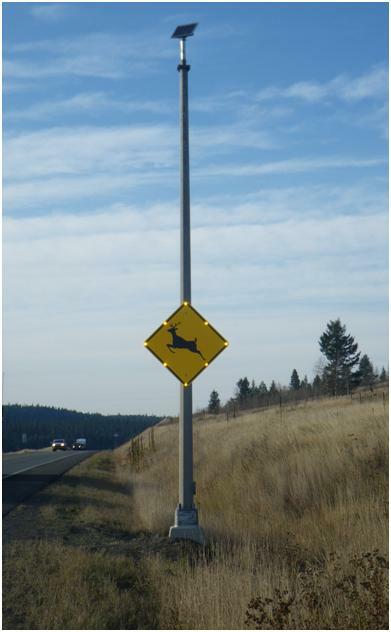 are familiar with the “leaping deer” depicted on provincial highway signs. But people travelling on Highway 97 south of Williams Lake and Quesnel may see deer signs with extra dazzle being tested in a pilot project by the ministry. Here, solar-powered LED lights that flash around the perimeter of six signs, are expected to make drivers extra aware that they are travelling through a stretch that’s highly popular with deer. The signs alert northbound and southbound motorists of three sections that are 40, 27 and five kilometres in length. The ministry’s wildlife accident reporting system shows that these areas are “hot spots” in the province, for deer sightings and collisions. For motorists that typically travel the more than seven-hour route from Prince George to Kamloops, at the posted speed of 100 km/h, a high-impact meeting with a deer would be bad news (for the driver and the deer!). The development and testing of these prototype illuminated signs are some of the steps we’re taking to reduce risk of injury and death for drivers and wildlife, and avoid damage to vehicles. To keep drivers alert for wildlife, these signs are programmed to flash based on deer activity, in the three different locations which range from 42 kilometres south of Williams Lake, to 15 kilometres south of Quesnel. Standard (non-illuminated) deer signs follow the flashing signs to keep deer awareness high in drivers’ minds. Mid February to the end of April – the lights flash from dusk to dawn – when deer tend to cross the highway seeking water or new ground. May – the lights go out and stay off for the sunnier (and quieter deer) months. Late September to mid February – the lights flash 24 hours a day. This is mating season, when the animals are less wary, and deer sightings and collisions are most common. How did we determine this cycle? The ministry’s wildlife accident reporting system is fed by data from the ministry’s area maintenance contractors based around the province. (On this stretch of road, that’s Interior Roads Ltd and HMC Services Inc.). As well, the Northern Health Bus which transports northerners to Kamloops and Vancouver four times a week, records animal sightings and roadkill on a GPS. They report this to a wildlife committee made up of ministry representatives, University of Northern British Columbia researchers and wildlife biologists who have been seeking new ways to protect people and animals on B.C.’s highways. On these active spots on Highway 97, the new prototype illuminated signs should help make it extra clear that deer could be near.